"Kimono" which is simply the Japanese word for "clothes", has come to mean "traditional Japanese clothing" that evolved during the Heian period (794-1192). The kimono assumed its present form during the Edo period when it came to be worn as a single layer with the belt tied at the back (until this time it had been tied in the front as is still the custom with yukata and belts on martial arts uniforms). process), which enabled greater use of colour and made highly decorated multicoloured kimono the norm. Family colours became institutionalized and each daimyo's troops effectively had a uniform, consisting of a kimono, a kamishimo (a sleeveless jacket worn over the kimono), and a hakama (a baggy trouser-skirt). Kimono making had progressed almost to the level of an art form with kimono being handed down like swords as family heirlooms. This practical and attractive book makes available for the first time the basic knowledge and vocabulary needed to select and put on a kimono and obi. Norio Yamanaka was born in Shiga Prefecture in 1928. In 1964 he founded the Sodo Kimono Academy, the first institute of its kind to encourage the wearing of Japan's national dress in everyday life. His philosophy is that wearing the kimono properly depends as much on the person's inner nature as on the garment itself. His movement has spread throughout Japan, and more than five million people have been taught how to wear the kimono by the fifty thousand consultants the academy has graduated. The kimono (着物) is a Japanese traditional garment worn by men, women and children. The word "kimono", which literally means a "thing to wear" (ki "wear" and mono "thing"), has come to denote these full-length robes. Fashioning Kimono by Reiko Mochinaga Brandon and others. 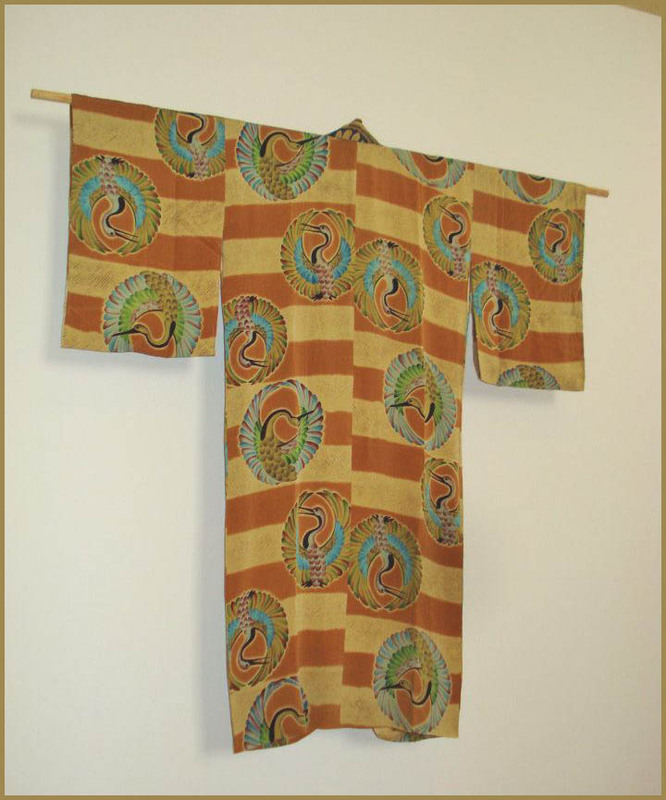 Kimono as Art by Itchiku Kubota. (London: Thames & Hudson, 2008). 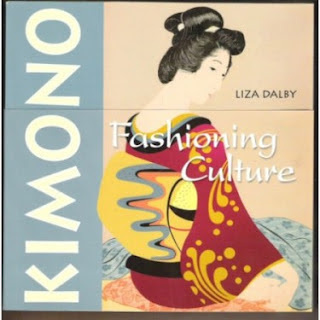 Kimono: Fashioning Culture by Liza Crihfield Dalby. (New Haven: Yale Univ. Press, 1993). Knit Kimono by Vicki Square. (Loveland, Colo.: Interweave Press, 2007). When Art Became Fashion by Dale Carolyn Gluckman. (Calif.: Los Angeles County Museum of Art, 1992). 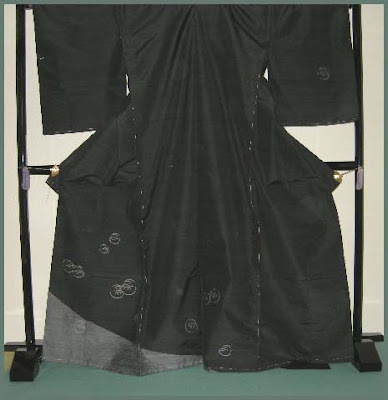 A formal kimono can be worn with a haori jacket as well as the hakama. The haori is held closed with a braided cord tied in a decorative knot. Today this type of outfit is mostly worn for very formal occasions, most commonly by the bridegroom during his wedding ceremony. 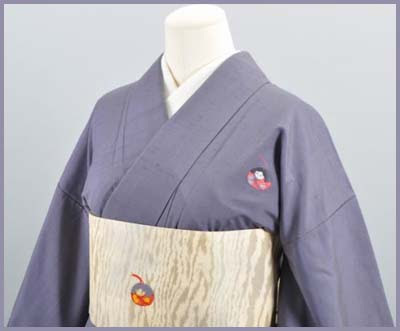 During the Edo period, men used a haori with a simple outside material and colorful silk imprints on the inside to show their individualiy. So we get some nice haori with Daruma san worn inside. 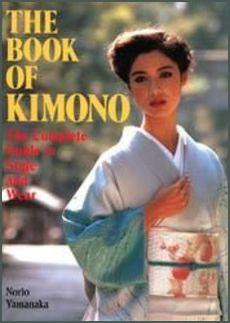 You can well imagine a priest wearing such a haori on a cool autum evening.
. . . Photo Album . . .
A great collection with explanations of Japanese culture. 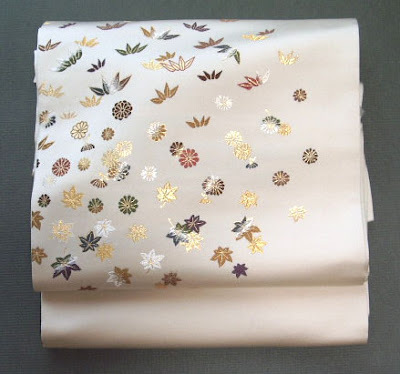 Ushikubi-tsumugi is a silk fabric made in the Ushikubi area of Shiramine in Hakusan city, Ishikawa prefecture. Ushikubi-tsumugi uses only pure river-bed water from the Tetori River and rare silkworm cocoons called “Tama-Mayu” in its process. The silkworm cocoons are first boiled down, spun by hand, and then elaborately weaved. All aspects of the process are done by hand and the fabric is famous for its strength among other silks. The origins of Ushikubi-tsumugidate back to the Heian period when the technique was first introduced to the locals by the wife of a Minamoto clan warrior named Oobatake. Oobatake became a fugitive after the Minamoto clan were defeated during Heiji no ran, or the Heiji Rebellion. 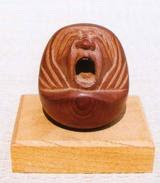 Ushikubi-tsumugi was highly regarded for its durability and much sought after during the Edo period. 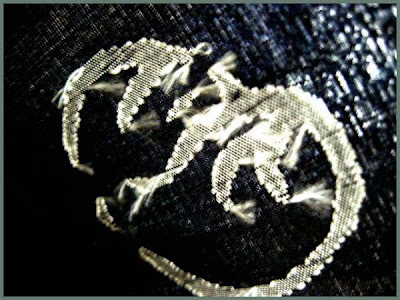 From the middle of the Meiji period to the beginning of the Showa period, silk production steadily increased, however with Japan facing economic depression and eventually war, production soon rapidly declined and the authentic silk industry disappeared all together for a time. After the war, silkworm breeding was resumed and the craft of Ushikubi-tsumugi was successfully revived. Today, Ushikubi-tsumugi is appreciated as one of the highest quality silk fabrics in the world.
. WKD : Warm things in Winter . The Fukiyose pattern depicts the scene of colored leaves or flower petals that are blown together by the autumn wind and fall onto the ground. Representative motifs of the pattern are maple leaves, chestnuts, pine straws, pine cones, ginkgo and ivy. All these motifs bring us the feeling of autumn. Fukiyose is very popular particularly outside Japan as the pattern represents the splendor of autumn with a Japanese touch. - - - - - Made of glass! - Autumn Sunset is the first in a series of four freestanding life-size kimonos representing the four seasons during different times of day. The kimono features the endless color changes evident in both an autumn changing landscape as well as an ever-changing sunset sky. Autumn Sunset is made of 19 separate pieces of woven glass supported by a metal mannequin. 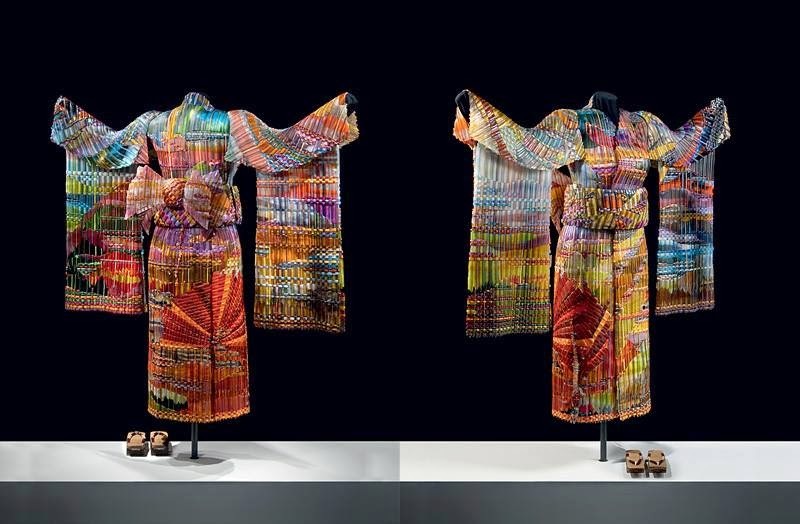 At 125 pounds, Autumn Sunset kimono is the largest woven glass sculpture in the world. The Nishinomiya City International Association in Hyogo Prefecture will hold a Yukata Day from 1 p.m. to 3:30 p.m. on July 5 in which foreigners can learn how to wear the summer kimono and enjoy a tea ceremony afterward. Kimono: A Modern History begins by exposing the seventeenth- and eighteenth-century foundations of the modern kimono fashion industry. It explores the crossover between ‘art’ and ‘fashion’ in this period at the hands of famous Japanese painters who worked with clothing pattern books and painted directly onto garments. With Japan’s exposure to Western fashion in the nineteenth century, and Westerners’ exposure to Japanese modes of dress and design, the kimono took on new associations and came to symbolize an exotic culture and an alluring female form. In the aftermath of the Second World War, the kimono industry was sustained through government support. 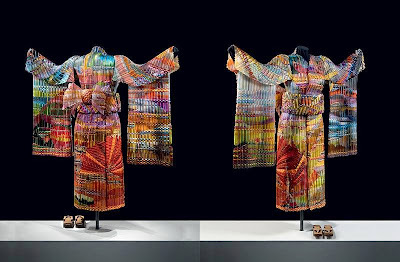 The line between fashion and art became blurred as kimonos produced by famous designers were collected for their beauty and displayed in museums, rather than being worn as clothing. (Thames & Hudson), edited by Anna Jackson.